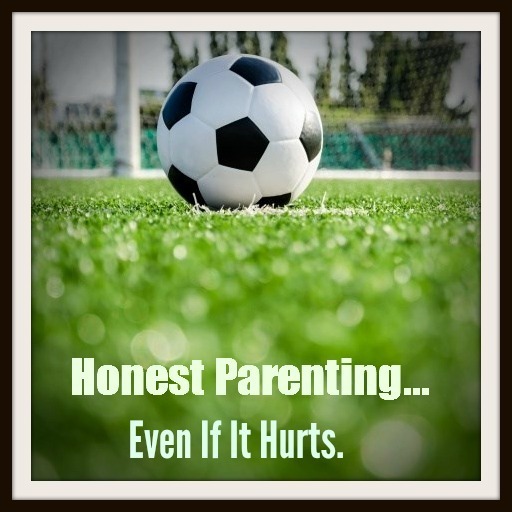 I am an honest mom... are you? I recently witnessed a horrible soccer match. All the kids on our team were not on their game. My son, who typically lights the field on fire with his dominance and outstanding ability to take control of the ball and score most of the goals... Sucked. I am an honest mom... are you? "Come ON BLUE!!! You can do THIS!" It wasn't pretty. Neither was I. I wasn't one of "those" parents that can be hideous -- I just wasn't pretty. I was bold, but edited within reason. Of course. So after the game, us moms who endured this brutal battle with despair and disgust were left defeated and with a heavy sigh, we accepted that this just wasn't their day to be "on." Then something happened. The moms took this turn toward the positive approach that is both honorable and redeeming, reflecting the true unconditional love of a parent. I on the other hand, still wasn't happy. I mean, yes, of course our boys are young and in the big picture, who really cares about one soccer game? It's all about "learning and growing and skill building and team work" right? My kid is 8 and plays on a 10-year-old team, and this game was against 11-year-olds. Bigger field, bigger boys, bigger numbers and bigger challenges. But I believe he could have tried much harder and played much better. In total honesty. I believe in honest parenting. As the moms all went to hug their kids and tell them they did great, I didn't. My kid knows I love him more than anything in this world -- but he also knows he will always, always, always get the truth from me. So as we united and walked to the car, I asked him why he didn't get in there and fight for the ball? I told him that he didn't play hard and he surely didn't give it his best. He knows that is the only thing that matters in these games, not the score or winning -- but *trying his best* -- and in all honesty I told him I didn't see that today. The ride home was difficult, but my son knows all too well how his mama operates. I was disappointed with how he didn't "show up" for the game, and the team did not play well. I told him my throat hurt from all the yelling. He asked, "What were you yelling mom?" I told him, and he laughed as I repeated the same shrieks of frustration and fitful phrases I belted out on the field. He gets it. He knows it was a horrible game. He knows I would never tell him something that wasn't true. And I believe both my kids appreciate this kind of honesty more than any false reinforcement or praise. Oh do they hear from me. Their mama pours the praise on every detail of the "good." And they bask in the honest feedback and utter joy of celebrating such beautiful pieces and parts of who they are. I can't tell you how much this pleases me, as I see my kids' eyes light up when I reach deep into their hearts and hold their goodness in the palm of my hands. They expect the truth from me. Because they know that although sometimes the truth hurts, ultimately it helps. My kids trust that I will not distort the picture to please them. They believe me when I speak, because they know for certain that what I share is authentic and not masked by ornaments of décor that are deceiving. I want them to have reality in living... because if I give them anything else, I am betraying the very essence of growth. On the way to that soccer game, Cade and I talked about the challenge it will be to play against an 11-year-old team, 8v8 and on a much bigger field. I told him all that mattered is that he give his best and what an awesome opportunity this would be for him to step up his game! He didn't do his best. He didn't step up his game. And that's what I told him. This post was originally published over at TheMomCafe.com. Chris Carter is a stay at home mom who blogs at TheMomCafe.com with hopes to encourage mothers through her humor, inspiration and faith. You can follow her on Twitter and Facebook and Pinterest.